Nothing new here: creative mommas have been dipping Nutter Butters in chocolates for many Halloweens past! 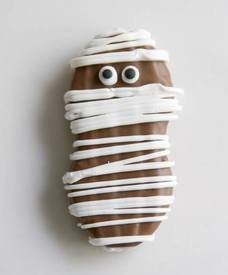 But take it up a notch by double-dipping once in milk or dark chocolate and then drizzling with white chocolate to create those iconic mummy bandages. Finish with some black-tinted royal icing eyes and your kids will be impressed that their MUMMY made these!